The Raider 100 E 344 is a guitar amp equipped with 100W of tube power and a single Celestion Vintage 30 speaker. 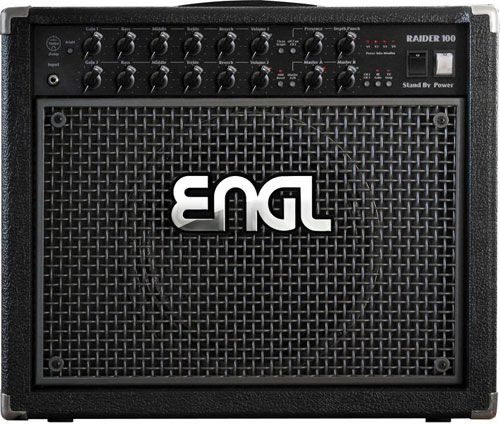 This ENGL amp will amaze you with it's fat bass, huge amounts of midrange and well dressed treble. In conjunction with the 100W power amp section, driven by 4 x 5881 tubes, the ENGL Raider produces the sound of many more speakers. 2 channels, that can be played in Hi or Lo Gain mode and deliver 4 different gain stages to use, allow the Raider 100 to be the perfect workhorse for straight fat rock sounds. Channel One shines with a clean sparkle. Engage the Hi Gain Mode and dive into big rhythm or bluesy lead tones. Channel Two impresses with big, bad Rock sounds even in Lo Gain mode. Using Hi Gain allows more sustain, rich harmonics, and adds nice smooth overdrive. The Raider 100 E 344 amplifier delivers tons of gain but still maintains clarity and its switchable Mid Boost gives you the chance to cut through in any situation. 2 channels, Hi/Lo Gain Mode, 3-band EQ , Bright & Clean Bright Switch, Mid Boost Switch, 4 x ECC 83 preamp tubes.